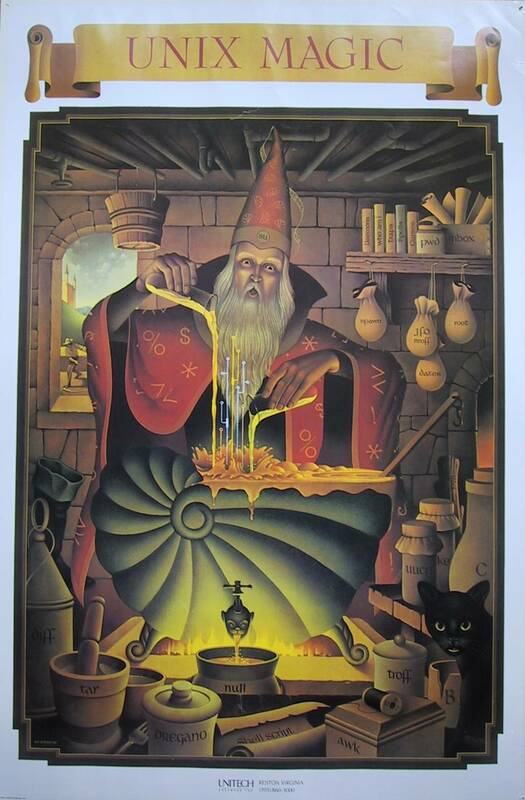 I recently retired and when I was taking stuff home from my office I found a couple of old Gary Overacre ‘Unix Magic’ posters that I’d been given back in the mid 80s when I was a Unix SA. One was still in the poster tube and the other was framed. I checked around a bit and saw that these are now considered extremely rare and might be worth more than a few bucks. I have no idea what to do with them. Anybody got any ideas on how to sell them or the best place to do it? Is Ebay about it? Yeah, I guess there aren’t too many unix/linux nerds here. I mean, I shared the picture all around the office to much approval, but I don’t really have any idea where you’d be best served selling it, so I didn’t say anything. I spend much of my day on a Linux command line. If I lived anywhere near Vegas I could take them to Pawn Stars. They’d bring in their local poster expert who’d value them at $200 each and then they’d offer me $25 because they have to make a profit, after all. I think even though they may be rare, there probably isn’t anyone out there clamoring to collect these. I’ll probably stick one on my computer room wall just to remind me of the good old days and stash the other one away where it will likely be tossed out with all my other geek stuff when I die. Maybe stick one on ebay and see what happens. Yes definitely sell on eBay. Worth a fair bit. That’s a tidy chunk of change for a non-vintage poster. Alternatively, there aren’t that many rare poster collectors. If they’re actually fairly valuable, you might be probably better off trying to find a specific forum or community where that stuff gets traded, rather than trying to put it up on ebay generally. There’s a fair amount of scams on eBay for rare collectibles. I don’t know where that kind of community would live, the closest I would know is retro games trading boards. I read this topic title and the first thing that popped into my mind was grep. Had that exact same poster on my bedroom wall growing up. Not sure what happened to it tho. @Coldsteel - Any chance you still have the Unix Magic poster and are interested in selling? Actually yes, I still have both of them. And yes, I’m still open to selling one or both. @Coldsteel Hey if the last guy didn’t pan out I would definitely be interested in the posters. I have been searching the internet for awhile now to try and get one, which ones do you have? I got a PM back when I first started this thread from a poster here saying they’d like one if I ever got around to selling them. So that person and mpage would get first crack at them. If one of them isn’t interested anymore then, sure. The reason I haven’t sold them yet is because I have no idea how to establish a fair value and then sell them in a way that protects both parties. It’s been a very tough year and so its just been low on my priority list. @Coldsteel No problem man I understand. Happy holidays! Any of these still for sell? Picked up the Unix Views at an antique store recently, framed for $60 bucks, would like the other two. @Coldsteel if you still have one and/or are still open to sell them at a fair value, I’m also interested. I just created an account here to ping you, but I’d prefer to talk about this privately. I can’t seem to find a way to PM you here so either PM me or let’s find a way to talk, if you are interested.